Media reports have brought attention to the strain the Dallas Police and Fire Pension Fund (DPFPF) is under, specifically it’s Deferred Retirement Option Plan (DROP). Ohio Police & Fire Pension Fund (OP&F) members may wonder if their DROP could face similar troubles. The answer is no. To read why click here. The interest rate for the period of April 1, 2019 through June 30, 2019, will be 2.41%. 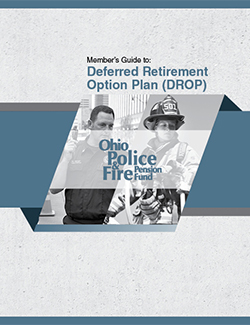 The Deferred Retirement Option Plan (DROP) is an optional benefit that allows eligible police officers and firefighters to accumulate a lump–sum of money for retirement. The Ohio Police & Fire Pension Fund (OP&F) is proud to offer this benefit to its membership, which has been the most requested addition to OP&F's benefit offerings in many years. The popularity of DROP programs has grown across the country since public sector employers first introduced them in the 1980s. Based on tremendous member request, OP&F has put in place a beneficial program without additional cost to members, their employers or OP&F. Thanks to member persistence, the support of member unions and associations and the receptive Ohio Legislature, the Governor signed Senate Bill 134 into law in 2002, which enabled OP&F to begin offering DROP in 2003. Enrolling in DROP is a voluntary decision that members should make after careful consideration of their own individual situation. OP&F strongly encourages all members to seek financial, legal and tax advice from professional counselors before entering DROP. Use OP&F Online to view your DROP contributions. OP&F updates your account information every night with the information we have on file, however, we have no control over when your contributions may be sent from your employer. Interest on your DROP account is calculated during the first week of each month. Click here to go to OP&F Online. Complete a new Direct Deposit Application to change where your DROP distributions are deposited.